After a brief hiatus, we are once again bringing our style and splendour down the South coast back to Brighton! We’re returning to the infamous Concorde 2 where it will undergo a colourful makeover as we channel the 1970's NYC club scene with our Paradise Disco theme! 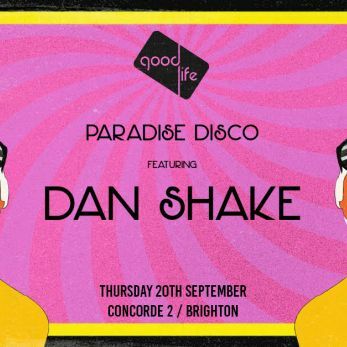 Joining us is one of Disco’s most prized assets; Dan Shake! We can't wait to have him join us once again at Good Life! Alongside this, we have an incredible support lineup TBA in due course. ≈ VENUE COVERED IN COLOURED SILKS AND BUNTING!